ABU DHABI (WAM) — Emirates Ship Investment Co (Eships), formerly Combined Cargo UAE (CCU), has ordered five chemical tankers from a Korean company at a cost of US$125 million (Dh458.75 million) as part of its expansion into the tanker market, the company said. The contract was signed by Salem Al Mazroui, chairman of Eships,. and H.J. Kim, general sales manager for Hyundai Mipo Dockyard. "Our strategy is to build up a sizeable fleet of small, medium range IMO type II/III coated product and chemical tankers for carrying contract of affreightment (COA) cargoes within the Gulf and the Middle East," Harald Lone, general manager of Eships, told Gulf News on April 23..
"The delivery of the five 13,000-dwt tankers will start in late 2006 and end in mid-2007." Earlier this year, the company bought an 8,100-dwt chemical tanker from Turkey's Anadolu Shipyard at a cost of US$17 million (Dh62.39 million). Delivery is expected this month. 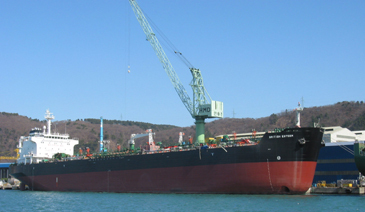 At the start of 2005, Eships was renamed from its earlier name, Combined Cargo UAE, following the exit of Norway's Klaveness Group which held a 24 percent stake. Now, Abu Dhabi Investment Co (ADIC) and the Mubadala Development Co each have a 32.89 percent stake while Oman and Emirates Investment Holding Company holds the remaining 34.22 percent. "The name change came about because the company has branched into other areas besides bulk. CCU was no longer an adequate name to reflect what the company is today." Lone said the company currently has a fleet of 10 vessels but will add at least 9 more product/chemical tankers in the short term.